​Founders looking for co-founders, talent looking for ideas and support, investors looking to invest, companies looking for partners, lenders looking to provide working capital, corporates looking new innovations to existing problems and opportunities for their customers and markets. The list goes on and on. Everyone and anyone trying to find what they are looking for from startup ecosystems - suffer from fragmented and limited information and access to data about the things they are looking to understand and about people and companies they are looking to connect and do business with. ​​Implementing and developing successful, competitive and digitally enabled ecosystem for entrepreneurship and innovation, should be considered as systematic process with long term mission that require proper and careful planning for structure and resourcing.​ Ecosystem Operators role is to serve various ecosystem functions equally and be a neutral and sustainable organization, with proper resourcing, long term and data-driven development perspective, with a strong mandate from all ecosystem key actors. 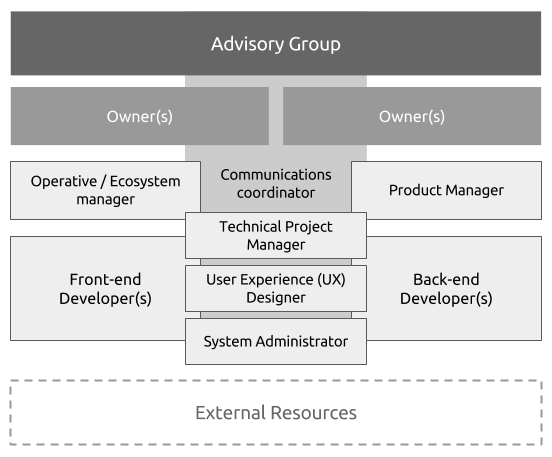 Ecosystem operator team needs to be operative, capable and skilled with holistic ecosystem knowledge and expertise, as well as have skills, operative capabilities and understanding of digital world and data economy developments. ​Too often there is no digital team at all, or at best digital team role has evolved over years from being a service department born out of traditional IT, where they end up implementing the ideas of other departments rather than provide digital leadership. Or digital teams have become the seat of all power when it comes to digital topics. Neither is healthy. Global digital landscape, with platform business models, digital ecosystems and data-driven economy, with serverless cloud infrastructures, API's, open source softwares, blockchain based solutions, along with new regulatory requirements like GDPR in EU, is constantly changing this digital landscape and related skills requirements for all organizations. It's no longer simply IT department managing IT and business and other non IT functions being hard separated on another department. This new landscape require that economic development and digital development functions needs to be understood and be operated closely together at ecosystem orchestration level, from finance to strategy to operations, and this is what Ecosystem Operators role is about. It maybe difficult to find any existing and capable team to take responsibility of your overall long term and sustainable ecosystem orchestration and digital ecosystem development needs. As such a new operator organization may need to be created. Good digital skills are in high demand and short supply - Digital teams should be responsible for developing, testing, and implementing a set strategy to reach, engage and serve target audiences through digital channels and applications like web, mobile, and social. While other groups may create the strategy, draft the messaging, etc. and digital teams should work hand-in-hand with Ecosystem Operator communication and service team leaders to create digital strategy, most often reporting through the CEO or COO level. ​Digital teams are also often responsible for providing guidelines and tracking for KPI's, implementing cross-channel analytics, surfacing relevant emerging trends and audience behavior. Digital teams build a strong collaboration with application developers and are responsible for critical technology infrastructure, data connectivity and associated applications. ​When we evaluate the core problem, it’s not that the information would not exist or about missing or wrong applications per se, so the solution is not to start creating new or replacing existing tools and trying to force everyone to use one system. Everyone should be able to use the tools they already know and like, or develop new connected applications if needed, while solving this problem. The missing solutions, is a connectivity framework and sharing practises, a digital backbone to enable application connectivity, sharing and data flow between ecosystem applications in use. To start connecting data from CRM’s, event systems, platforms etc. After connectivity is build, every application or data owner can still separately decide what data they want to share an in what terms. ​ We call this EcosystemOS. ​Connect And Collaborate with Digital Ecosystem Development and Operator Peers. "Ecosystem development knowledge combined with digital expertise and close ongoing operations with ecosystem, is key to success!" ​Optimally, a local digital team is, or would be part of an broader and dedicated ecosystem operator team in an independent non-profit association or company, - that is owned, funded and/or resourced by local key organizations as public private partnership (PPP). In an Ecosystem Operator organization that represents the majority of local ecosystem key functions and actors via associated advisory groups, an organization that can naturally collaborate and bridge, both public and private interests and develop a culture that can truly represent your local ecosystem. If the Ecosystem Operator with digital ecosystem team and/or organization is created new, resourcing for first three year period should be targeted, to have enough time to find, select and train - good operative, committed & motivated people for needed roles. And to have enough time for all other actions needed to be made to make the Digital Startup Ecosystem and operations fully functional, operating with knowledge, drive and efficiency for globally competitive, growing and developing digital startup ecosystem. ​Advisory group and/or board or directors should represent you local Startup Ecosystem key organizations and people from various ecosystem segments and functions. In addition to governance role, it should to give perspective, recommendations, guidance for making decisions and prioritization of ecosystem development initiatives and digital ecosystem development roadmap items and to act as channel of information between digital ecosystem development and specific ecosystem segments. As any organization, group should select chairperson amongst the group members, define basic agenda and schedule group regular meetings (monthly or minimum once per quarter). Operative manager supported by communications coordinator should act as moderator and secretary for the advisory group. "If digital exists within a "single silo" it does not help ecosystem development adopt a ‘digital by default’ culture. It doesn’t help the organisation make digital as ubiquitous as electricity." Below is a list of team member roles and types of responsibilities each role include. With each role, there should be also overlaps with responsibilities to make sure at least two people are always aware enough about the details and responsibility of close peer to act as a backup resource for unexpected issues and bridge knowledge in case of potential rotation of people in the unit. Person to oversee the operative team and to communicate between higher management, operative team, external resources and key partners and user groups. Experienced junior or mid level manager for community users onboarding, training, end user support, updating information, blogs, newsletter, meeting planning, reporting support, etc. Technically knowledgeable but project management focuses manager, to manage product development related work, translating requests from user feedback, UX designer, business strategies and other requests to project plans, budgets, timelines. And to manage the project's development and documentation from owners perspective. UX designer with visual design skills, to capture ongoing user feedback, technical specifications and conduct research to be able to visualize user journeys and new functionality needs or changes with visual UI mockups. Further permanent or temporary roles may be identified as part of ongoing operations. These needs to expand/reduce resources should be evaluated periodically together with advisory group. "The digital economic development of city, region or country should remain under own control. - Not controlled by foreign government or be monopolized by private businesses." Regardless for what may be optimal, the reality is that each ecosystem is different and have different initial starting point, existing organizations, teams, budgets etc., Additionally there may be need for pilot or proof of concept via additional approach. So you need to assess and plan the initial local starting point and first milestone project accordingly. In case of "building the digital ecosystem operations and team from scratch" , there is not much value in the process between "building the team & organization and making it all operationally function", including hiring the people, managing HR, defining operative practises, processes etc. So in some cases it may be most efficient to outsource the entire digital team setup for a local or global consulting house, digital agency or consortium and only hand of the responsibility of the team to owners, once it's reached initial milestones and is fully operational. Sitting on same side of the table, together with you and your preferred partners, we can help you get your local digital team setup and make it fully operational. Startup Commons help plan and design fundable projects for establishing and resourcing local Ecosystem Operators and together with our partners, support in making them operational and sustainable in long term.